We’ve been writing quite a bit in the past week about the rapid drop in the cost of solar panels and the massive money you can now save by going solar. That’s all been focused on today and recent years. But let’s take a step back and see how solar energy cost got so low. Basically, decades (er… almost two centuries) of research and development got solar energy technologies to the point where they could start to compete with conventional energy sources (even without putting a price on pollution or global warming). The advancements were fewer and far between early on, but that doesn’t make them any less important. 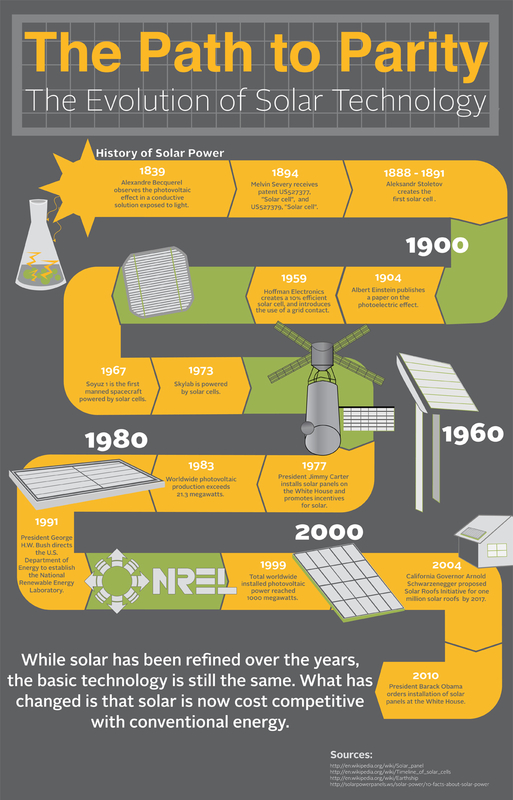 Early research by the likes of Alexandre Becquerel, Melvin Severy, Aleksander Stoletov, and Albert Einstein was critical to solar energy technologies getting to where they are today. As solar technologies have become more and more promising, research and development have increased, and the cost of solar energy has come down. The result of that, of course, has been more and more people, businesses, and utilities getting their electricity from solar panel systems. As the infographic below notes, in 1983, the world had over 20 megawatts (MW) of solar power installed, and in 1999, we reached 1,000 MW. Now, the world has about 100,000 MW of solar power installed. Imagine where we’ll be in 10 years…. Notably, solar energy cost hasn’t come down only due to research and development (R&D) in the US, but also due to R&D in Germany, Japan, China, and other places. Also, big driver in the reduction of solar energy cost has simply been market growth and the economies of scale that come with that. As with basically all technologies, as production grows, costs come down. And the market has certainly been growing!